Runners and walkers braved the intense cold in Cochrane, Alta. on Sunday to support women and girls half a world away. Ultra-runner and world-record-holder Martin Parnell held his eighth-annual fundraiser at the Spray Lake Sawmills Family Sports Centre, with the goal of raising $5,000 to build a small, outdoor skating rink in the city of Bamyan, Afghanistan. Bamyan is in the east-central part of Afghanistan, about 180 kilometres west of the capital city of Kabul. A small skating rink was built there by the Canadian government last year, but the locals can't afford to flood it again. Parnell partnered with Free To Run, a non-governmental organization with offices in Kabul. It uses running and outdoor adventure to empower women. Parnell wants to see the rink built once again to give women living in the area a chance to be more active. "The key in Afghanistan is the inequality between boys and girls," he said. "Boys can do many things, girls can't, and this is an opportunity for girls to do something boys do." The outdoor rink will be built by locals on a small cement pad and Parnell says there are plans to hold a week-long event in March, when girls from other provinces around Afghanistan will travel there to try skating and other events. "We live in a global village. It's a global community, and the opportunity to help others in a place tens of thousands of kilometres away is really positive," said Parnell. "It's helping somebody we don't even know." Sunday's event may seem like a small gesture, but will have a lasting impact, said Leanne Britnell, the volunteer coordinator for Women for Women in Afghanistan. "Once you give people a voice, that voice becomes bigger and that voice can then be heard," she said. The temperature was -47 C with the wind chill on Sunday. 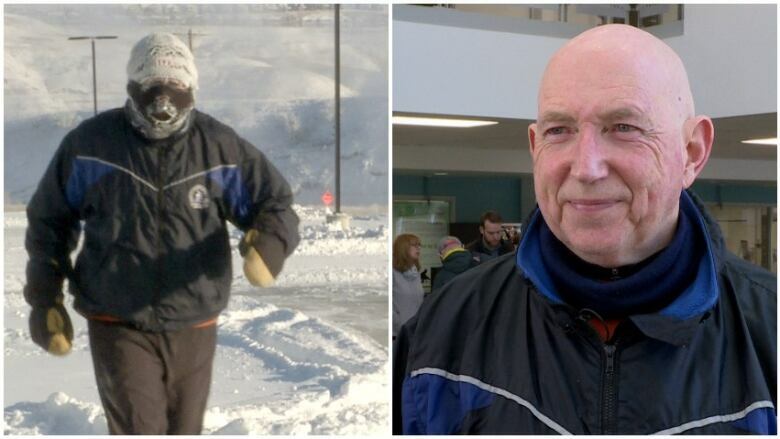 Parnell, who holds five Guinness World Records and once ran 250 marathons in a year, says was it was the coldest conditions he has ever run in. "The challenge is to keep warm," he said. "The challenge is that you literally have to cover every inch of exposed skin and the only thing you can have left open are the eye slits, and even then your eyelashes get all frosted up." People hoping to donate to the cause can do so on the event's Crowdrise page.